Chirlane McCray is doing the work. A recent write-up in the New York Times noted that McCray had redefined the role of first lady in the nation’s most populous city, with the paper calling her “likely the most influential, if not consequential” first lady in New York City’s history. McCray’s focus on mental health services in her first term as first lady is ambitious and, in some ways, radical. McCray told the Times that her job is to create systemic change—and making mental health one of New York City’s core responsibilities is how she envisions creating that change. 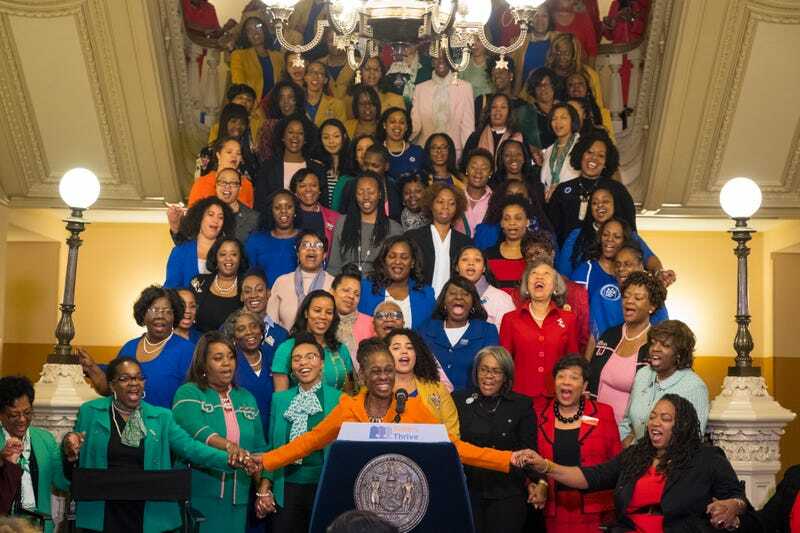 On Monday, McCray announced the latest component to ThriveNYC, her signature mental health initiative, Sisters Thrive, which harnesses the power and service of black women to address the unmet mental health needs of the black community. McCray will spearhead a national coalition that brings together six historically black service organizations: Jack and Jill of America Inc., the Eastern Area of The Links, Incorporated, and each of the nation’s historically black sororities—Alpha Kappa Alpha Sorority, Delta Sigma Theta Sorority, Zeta Phi Beta Sorority and Sigma Gamma Rho Sorority. “It’s hard for me to imagine any group, any demographic, that is more deeply involved in terms of service to the community than these women,” McCray tells The Root. The initiative is significant because black women are so frequently an afterthought, if they are considered at all, in conversations about health, generally. With Sisters Thrive, McCray not only centers black women but also taps into their networks and their commitment to their communities to create a viable, sustainable solution. One of the coalition’s first-year goals is to train 10,000 black New Yorkers in Mental Health First Aid, a course that teaches people how to identify and respond to signs of mental illnesses and substance-use disorders. McCray took the course before launching ThriveNYC—“I was transformed by it,” she says. “We all know what to do if someone is bleeding, if somebody fractures a body part. But we don’t know what to do if someone has a panic attack or someone is suffering from depression,” McCray says. “These are everyday skills that everyone should have. “Since black women are so often the caretakers of their family members and extended family members, it just makes total sense that it’s a win, win, win,” she adds. Everyone involved in the initiative will take the class and then pass that education on to others. Sisters Thrive also aims to create a more diverse mental health workforce, developing a professional mental health pipeline within the first year. McCray noted that African Americans are 20 percent more likely to experience serious mental health challenges than the general population. In fact, McCray dropped statistic after statistic in our conversation, a sign of her preparedness and passion, but a trait that also speaks to the evidence-based nature of these initiatives. “How are we possibly going to serve people who so desperately need services if we are not able to be creative in how we serve?” McCray asks. It’s clearly a question that has formed the bulk of her initiatives around mental health. ThriveNYC comprises 54 targeted initiatives (though 31 had previously existed in various forms). Since its formation, ThriveNYC has developed into Cities Thrive, a nationwide coalition of 185 cities working together to improve their mental health systems. McCray, who has candidly addressed her family’s struggles with depression and addiction, has learned a lot through her work. One of the most striking lessons, she says, was through NYC Well, the public help line she launched last year that connects New Yorkers to free and confidential mental health support. McCray says that she had initial concerns about counselors being properly trained to handle calls about opioids, but in fact, many more callers sought counseling for alcohol-related problems. McCray also has learned that many New Yorkers trying to access the city’s public service organizations—the kinds that offer parenting skills or job training—may suffer from a mental illness. “They walk into these community organizations and, often, they’re just not ready to really be able to access the services that the organization provides,” McCray notes. But through the city’s Connection to Care program, which partners 15 city organizations to mental health institutions, those clients can now be referred to a mental health professional. Providing these services, McCray says, is integral to effecting the sort of systemic change she envisions. “There is no social service that is not affected by taking [mental health] on,” McCray notes, listing policing, education and hospital expenses as examples. Prioritizing mental health and directing resources to it, she says, is money well spent. Why Aren’t More African Americans Opening Up About Their Mental Health?